The most popular route is Trelleborg to Sassnitz. The average price this month for this route is £69 for a car and two people each way. Booking a ferry to Germany is simple, easy and safe with AFerry, just use the booking form above to get a price. Booking a ferry to or from Germany couldn't be easier with AFerry. You can either use the booking form at the top left of the page. 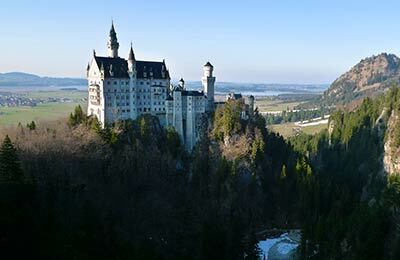 Visit Germany to discover the country's beauty and rich history. Visit the Berlin wall and its museum, travel to Munich in the south to experience the annual Oktoberfest or take a trip into the mountains to see breath-taking views and indulge in activities such as skiing and snowboarding. 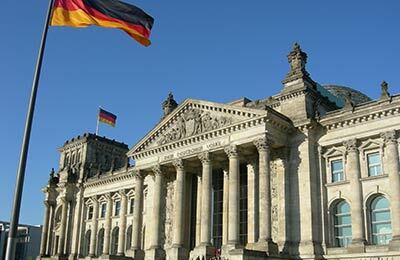 Germany is the home of major car manufacturers BMV, Porsche, Audi and Volkswagen. As a result, the Germans take their cars very seriously and the country has a widely developed motorway network. Most famous of all are the Autobahns, though only about a third of these are totally without speed limits. German cities are diverse and each city offers something different. Berlin is particularly known for its nightlife and food, though Hamburg, Frankfurt and Leipzig are all trying to compete to become the place to go for entertainment. Germany is the economic superpower of Europe and a popular destination for tourists seeking rich food, good beer and wine and a country full of historic sites. Whether you're a historical building addict or simply seeking a vibrant night life, Germany has something to offer you. Germany is the home of major car manufacturers BMW, Porsche, Audi and Volkswagen. As a result, the Germans take their cars very seriously and the country has a widely developed motorway network. Most famous of all are the Autobahns, though only about a third of these are totally without speed limits. At German petrol stations, especially on the motorways, it is normal for the petrol pumps to insist that you enter your credit card details before you start filling up with petrol. Use of mobile phones is forbidden (and strictly enforced by the German police) and the police are also strict on drink driving - the limit in Germany is much lower than in the United Kingdom. If you are not travelling by car, the obvious alternative is Germany's fast and efficient rail system. Trains come in various different flavours - U-Bahn and S-Bahn trains are a simple way of travelling round German cities, whilst ICE trains are a reliable, fast and comfortable way to travel across the country. Booking tickets on the day of travel is generally expensive, so you are advised to book in advance. The German train companies all have comprehensive English websites and offer discounts on advance bookings. If you are travelling by train around cities in Germany, it is essential to remember to validate your ticket before travel. This is done by inserting the ticket into the yellow machine. Failure to do this can lead to fines from ticket inspectors on board the trains, even if you have bought the correct ticket. It is worth knowing that many Germans buy "Wochenendetickets" on local train services. These are train tickets that allow up to four people to travel together. Therefore, it is often possible to find someone on your train who will be happy for you to travel with them and therefore save you money. The normal way to ask is with the phrase "Darf ich mit Ihnen mitfahren?" It is often possible to find someone on your train who will be happy for you to travel with them and therefore save you money. Germany cities are diverse and each city offers something different. Berlin is particularly known for its nightlife and food, though Hamburg, Frankfurt and Leipzig are all trying to compete to become the place to go for entertainment. One particularly interesting club in Leipzig is the vast underground Moritzbastei. This was dug out by students in the 1970s and remains a popular night venue even now. Many cities, especially historic cities such as Munich and Berlin, have a wide range of historic attractions. Munich especially has a historic range of buildings, including the old Opera House, beer halls, churches and the famous castles built by Bavarian King Ludwig in the Nineteenth century. For nature lovers, there is plenty to see in Germany. The environments ranges from rugged sea coasts to the high rise banks of the river Rhine. Wind surfing is possible along Germanys northern coast, whilst the upper stretches of the Rhine are popular for canoeing and walking. Alternatively, for wine lovers, the banks of the Rhine are covered in temperate vineyards which are used to produce the world famous wines. German forests are particularly famous for their wild and lush vegetation, resulting in a mythical, prehistoric quality . Ramblers should be aware of the dangers of wild boar - encounters with these animals can result in severe injury. On no account should they be approached. Finally, Germany must also be mentioned for its beer. In general, whilst all big cities have a few beer gardens, the best beer and most amiable company is to be found in the south of the country, particularly in Bavarian cities such as Munich and Nuremberg. Beer is sold in litres and is traditionally eaten alongside giant Pretzels. For those wanting a lighter drink, you can buy a Shandy in most beer gardens - ask for `ein Radler'. The traditional time for beer festivals in Germany is mid August until October. Whilst the Oktoberfest is often the most popular beer festival, local town festivals often have a nice atmosphere and the beer is generally about half the price of the Munich festivals. Whilst the Oktoberfest is often the most popular beer festival, local town festivals often have a nice atmosphere and the beer is generally about half the price of the Munich festivals. 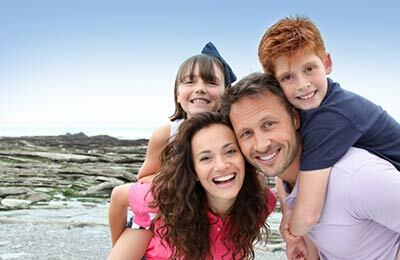 AFerry offers the best way to find the cheapest ferry routes to Germany with its easy to use booking form. Begin your holiday on a ferry and start relaxing straight away!